A long day - almost 12 hours' cycling - of endlessly beautiful loch views. 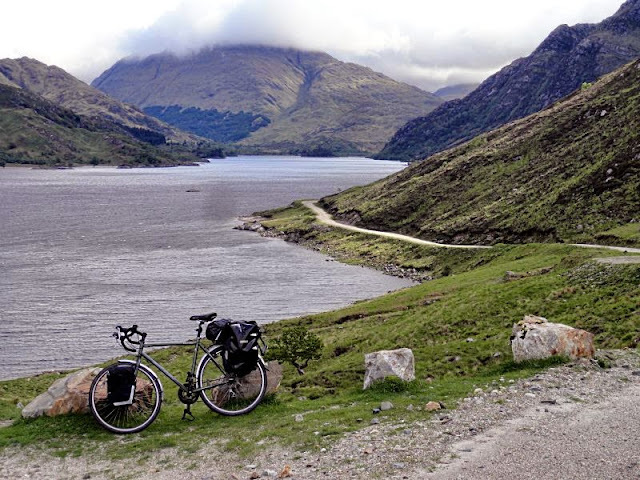 I cycled north out of the sea-level campsite at Strontian at 6am and got up to 380m (picture) on just a banana and Twix. Sounds pretty efficient fuel consumption to me. A huge descent took me past Loch Doilet, which is crying out to be in the first line of a Limerick, and I then had a superb 15-mile flat car-free ride on the forest road alongside Loch Shiel (picture) up to Glenfinnan, home of what is apparently the Harry Potter viaduct, though I recognised it from Scottish ten pound notes. I went along the south shore of Loch Eil (picture) along a fantastically scenic flat A road that was about as wide as my bike. I got chatting to a fine fellow cyclist, Alasdair, who was clearly a lot faster than me, but then most people are. 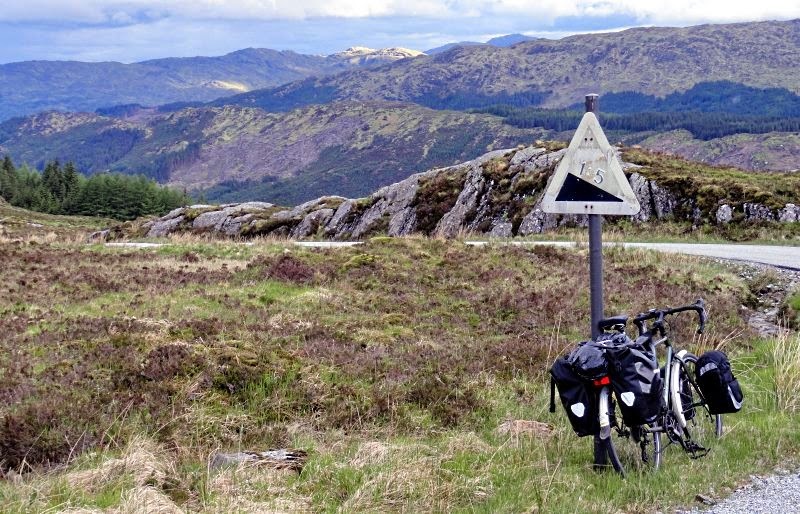 After the ferry across to Corran, I followed Alasdair's tip and took the Sustrans NCN78, 40 miles south to Oban. 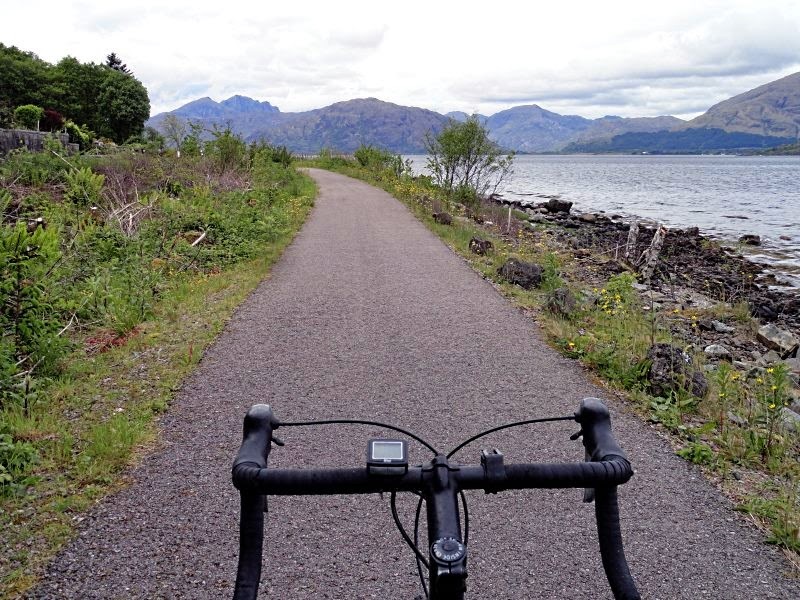 Some bits are still being joined up, but much of it is an astoundingly scenic (picture), and very well-surfaced, flat railtrail with superb views of Loch Linnhe. 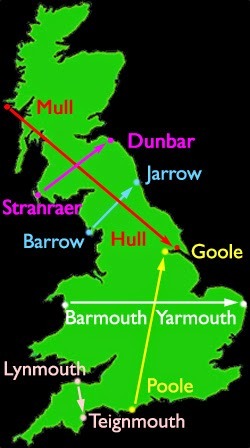 I can recommend doing it in a tailwind, as it was today. I found a hostel in Oban which, by total coincidence, is a short walk from Wetherspoon's.